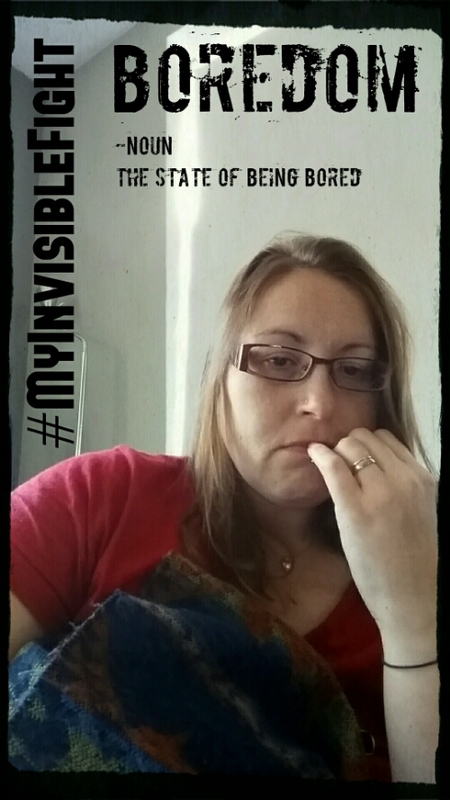 #MyInvisibleFight #3 Bored of being bored! – Living life the MegaSpecial way! #MyInvisibleFight #3 Bored of being bored! After seeing the post on Facebook (shown above) I have decided I shall take part & so every time I see a photo opportunity of #MyInvisibleFight I shall post the picture on instagram & here on my blog site which will then share to Facebook & twitter! If you know me, are close to me & think this will be too upsetting for you then please stop reading now. My intention isn’t to upset people, nor is it to make people feel sorry for me or others with Invisible illnesses. We don’t need a ‘Pity party’ we just want people to understand & realise how hard it can be for us! How incredible we are! How strong we have to be! To be honest, this is quite a good ‘pick me up’ for me as I often forget the challenges I have & still do overcome! My 3rd picture is so terribly boring! No no no, not the picture! The picture isn’t boring, it shows boredom! Everybody at some point experiences boredom but I suspect it’s short lived? What if you experienced boredom everyday. What if you were looking forward to the weekend, only to find out you when you wake in the morning any plans you had that day would have to be cancelled! That’s right, cancelled! I didn’t have many plans for today, Saturdays are usually my days off from exercise especially when my partner is off work so that wasn’t a problem for me, what was a problem was my pain levels! Far too high! It was then that I was asked if I wanted to go clothes shopping! Seriously! But we went shopping last night, I hadn’t anticipated going today as well! The fear then is not knowing how long I’ll be cancelling plans for! Is this going to pass soon? Temporary, it’s only temporary? Please let it only be temporary! Oh man, I’m bored already! ‘Ping’ goes my phone, I reach for my phone & smile! This is when the fashion show begins, yey! I have always love clothes shopping so this was perfect, I didn’t feel as though I was missing out at all! I’m very lucky in that I have wonderful friends who I get to chat with most days via the wonderful world of technology that we live in today! That wasn’t the case for me 5 years ago when I was suffering badly from acute Multiple sclerosis relapses. At this point I didn’t have the amazing network of friends that I have now! I didn’t have the knowledge or the understanding of my 2 illnesses (Multiple Sclerosis – MS & Fibromyalgia) as I do now & I certainly didn’t have the ability to say ‘you go, I should really stay here’ What I did have was a lot more days when I had no choice but to stay in bed because I didn’t ‘look after me’ and because I didn’t have all my Internet friends I had a tremendous amount of boredom!